The NTT IndyCar Series is the premier open-wheel, open-cockpit racing series in North America. 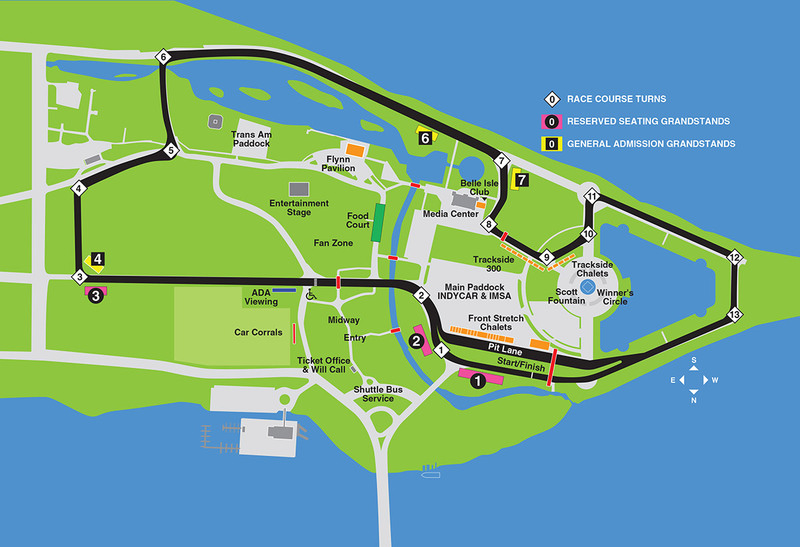 The series offers one of the most diverse and challenging schedules in motorsports, with races held on superspeedway ovals, short ovals, permanent road courses and temporary street circuits such as The Raceway at Belle Isle Park. Chevrolet and Honda are the competing engine manufacturers in the NTT IndyCar Series. Dallara is sole chassis maker developer of the universal aero kit for all cars that premiered in 2018. The IMSA WeatherTech SportsCar Championship is North America's premiere sports car endurance racing series. Competitors from across the globe compete for honors at some of the most historic and iconic race tracks in North America. The series features a total of four classes: Daytona Prototype international (DPi), Le Mans Prototype 2 (LMP2), GT Le Mans (GTLM), and GT Daytona (GTD) racing at the same time at most races, driven by many of the world's best road racers. The Chevrolet Sports Car Classic on Belle Isle will include the DPi and GTD classes. The DPi class features the fastest and most technologically advanced cars in North America. DPi cars from manufacturers such as Acura, Cadillac, Mazda and Nissan are specifically designed and engineered for the race track. While unique in appearance, the technology being developed in the DPi category is relevant and directly tied to manufacturers' R&D initiatives. The GTD cars are enhanced by technology and utilize the global FIA GT3 technical specifications. The GTD class consists of cars from leading manufacturers such as Acura, Audi, BMW, Ferrari, Lamborghini, Lexus, Mercedes-AMG and Porsche. The 12-race 2019 WeatherTech Championship schedule is highlighted by endurance races such as the around-the-clock season-opening Rolex 24 At Daytona, the Mobil 1 Twelve Hours of Sebring Presented by Advance Auto Parts and the 10-hour Motul Petit Le Mans at Michelin Raceway Road Atlanta. To learn more, visit www.imsa.com. A Pro class is designated by RED markings on the number panel, mirrors, windscreen banner, rear wing end plate and leader light. A Pro-Am class is designated by GREEN markings on the number panel, mirrors, windscreen banner, rear win end plate and leader light. The Trans Am Series presented by Pirelli began igniting the passion of motorsports fans across the world in 1966. Today, Trans Am continues to honor its legacy, while challenging the status quo in racing through meaningful racing platforms and a driver-oriented focus. Featuring world-renown GT cars in TA, the revitalization of the pony wars in TA2, and pure production racing in TA3 and TA4- Trans Am is truly America's Road Racing Series. Over the course of its 54-year history, Trans Am has featured road racing icons such as Bob Tullius, Peter Gregg, Wally Dallenbach, Jr., Dorsey Schroder, George Follmer, Mark Donohue, Sam Posey, Scott Sharp and Tommy Kendall. The full Trans Am Championship returned to race on Belle Isle in 2017 and the 2019 Detroit race weekend will feature two races from the TA2 class in full force.